When she was growing up, Irene Patsalides, Mirenesse founder, loved to experiment with different cosmetics. She tried many different brands but was disappointed when the makeup did not perform as expected. Patsalides decided to develop the high-quality makeup she sought but could not find. She was passionate about bringing a hypoallergenic makeup to market that would give women the shades, textures, and flawless finish they desired. After training as a cosmetics chemist and pharmacist, the 25-year-old Patsalides began the process of developing her own line. Welcome, Mirenesse! 'Our philosophy is really quite simple: if a product isn’t good enough for us, it’s not good enough for you!' This statement represents Patsalides' vision of bringing safe and natural cosmetics and beauty products to women around the world. Australian-owned Mirenesse has the distinction of currently being Australian’s #1 online beauty brand. The company has received many top honours for some of its best-selling products, such as Velvet Lip Lift Moisture Shine, Mirenesse Matte Liquid Silk Foundation, and the iCurl Heated Lash Curler. 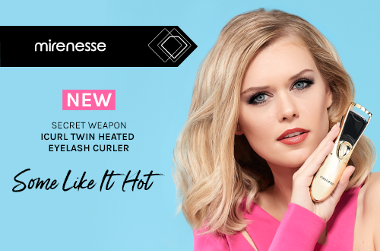 One of the most successful formulas from Mirenesse is its signature Secret Weapon 24 Hr Mascara. This long-lasting mascara won numerous international honours in 2010 and 2011, including Favourite Mascara Brand — Reader’s Choice Awards in the Australian Beauty Awards. With over 20 years of experience in the pharmaceutical and cosmetics industries, Irene Patsalides brings professional-quality makeup to today’s demanding consumer. Showing 20 products of 58. The best mascara hands down. I used to be all about Dior show mascara- a great volume mascara but this is better. There’s so many good mascaras out there that give volume however this one is made the best by how it comes off easily, doesn’t smudge and doesn’t flake. I can wear it to hot yoga! It’s that good. My ideal mascara is one that does not smudge or flake, and that it is natural looking. I feel like this mascara certainly achieves this and it leaves my eyelashes soft, and mascara is easy to remove. One downside is that I feel that it does not maintain the curl of the eyelash as well as I would like. Even though I found this quite scary to use it actually worked quite well! !